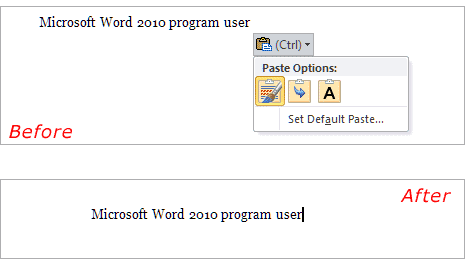 If you are regular Microsoft Word 2010 program user, then “Paste Options” box might figure as most irritating feature. By default, when you press Ctrl + V keys to paste copied text – paste options box appears. 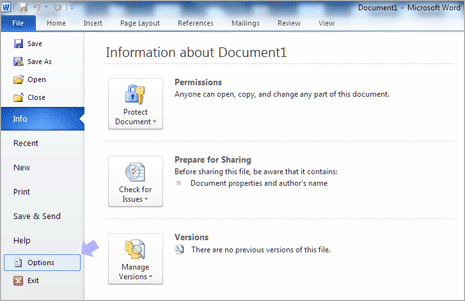 It provides quick options to paste text: with original formatting, merged formatting and keep text only. For an extensive Microsoft Word user, this feature is more of an annoyance rather than of good help. You can disable and turn off this feature of ‘Paste Options’ button. 1. Open Microsoft Word 2010 program on your computer. Then goto File > Options menu option at the top. This will open ‘Word Options’ box with lot of options that you can customize. 2. In the ‘Word Options’ box, click on ‘Advanced’ tab on the left side. Then scroll down right side and look for “Cut, Copy and Paste” section. It has all options for paste routine in Word 2010 program. 3. Click to uncheck (no tick) next to “Show Paste Options button when content is pasted” under “Cut, Copy and Paste” section. 4. Then click OK to close ‘Word Options’ box. Now copy any text and press Ctrl + V keys to paste it – Paste Options box (button) will not appear now. Annoyance fixed!